Ultra Music Festival has dropped the second episode in its retrospective documentary series, 20 Years of Ultra, which explores the ongoing legacy of the Miami-based party. The second episode features interviews with John Digweed, Tiesto, Hardwell, Josh Wink and many more and specifically explores the period in the early 2000s when local laws and regulations made it very difficult for large electronic music gatherings to take place. 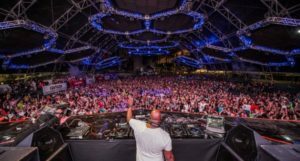 According to a press release, Ultra Music Festival subsequently became “one of the only places in the United States where electronic music fans could see a large number of DJs and LIVE acts that had received international acclaim in one place”. You can watch the second episode of 20 Years of Ultra in full below. Episode one of the documentary dropped at the start of February with filmmakers rewinding to Ultra’s inaugural party which featured acts like Josh Wink, Rabbit In The Moon, AK1200 (America’s first junglist), Sandra Collins, Icey, and Miami’s own George Acosta. This year’s Ultra Music Festival will take place from Friday 23rd to Sunday 25th March at Bayfront Park in Miami, Florida. Tickets to the festival are available via their site. Ultra Music Festival was voted the world’s No. 1 festival in DJ Mag’s Top 100 Clubs poll in 2016 and 2017 respectively.